Matthew Yglesias recently noted that the very rich are unhappy with President Obama because he would like to increase the taxes on the very rich. Although this might be true, the number of people unhappy with Obama exceeds the number of people who comprise the very rich. So why are many of the non-rich unhappy with Obama? And why are so many other people quite happy with our current president? Perhaps the answer is similar to a story frequently told about sports fans. Back in the early 1990s, a friend of mine declared his hatred of Charles Barkley. At the time, Sir Charles was an All-Star for the Philadelphia 76ers. Sometime after this declaration, though, Barkley was traded to the Phoenix Suns. As a fan of the Suns, my friend changed his tune. With Sir Charles in Phoenix, my friend was now a fan of Barkley. More recently, LeBron James was an extremely popular athlete in Cleveland. But when he changed his uniform to something from Miami, his popularity in Ohio plummeted. Although many fans – and I am one of these – are essentially “rooting for clothes,” the emotions sports generate are quite real. When one of my teams wins, I am quite happy (at least for awhile). And when my teams lose, I am unhappy (for more than just “awhile”). Sports may just be entertainment, but the power to alter our perspective on life – if only for a short time — is quite amazing. Such power reminds me of how people react to politics. What about health care? Mitt Romney implemented a plan from the Heritage Foundation while governor of Massachusetts. Barack Obama backed a very similar plan. Somehow, though, many Republicans are very troubled by Obama’s health care plan (even Mitt Romney!). But many of these same Republicans (even Mitt Romney!) were not troubled by Romney’s health care plan. One might think that in sports fans are rooting for players. But in reality, many fans are just rooting for clothes. Likewise, we might think that voters are interested in issues. But the above examples suggest that many voters are just rooting for parties. The actual issues each party says they care about don’t seem to be very important. What is important is that the party the voter follows actually wins the elections. And when this doesn’t happen, as it did for Republicans in 2008, voters become very angry. A Gallup poll seems to capture this point. Over time, 46 percent of people generally say they believe the federal government poses such a threat. But who voted yes –as the following graph indicates – changed quite dramatically over time. The results suggest that Americans’ perceptions of the government as a threat may be less dependent on broader, philosophical views of government power, and instead have more to do with who is wielding that power. 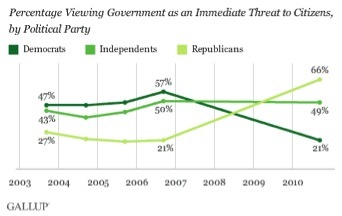 Throughout the Bush administration, Democrats were more likely than Republicans to perceive the government as a threat. Now that a Democratic president is in office, the reverse is true. One should note that while Democrats and Republicans changed their answer depending on whether their team was “winning”, independents (like me) didn’t change their view very much. All of this suggests two research questions (and these questions may have already been addressed by someone – in fact, some related research is referred to in a recent New Yorker article by Ezra Klein). First, it appears that issues may not matter as much as pundits think. So at least (and I am not sure how this can be done) I think we need to see how much voters are rooting for issues and how much voters are rooting for parties. If the latter effect dominates, maybe we need to have sportscasters discuss our elections (and maybe many voters would be happier waving pennants instead of protest signs). In addition, it would also be interesting to see if sports and politics are treated the same by the human brain. Are these different activities mentally? My sense is that sports and politics really are the same. And again, that suggests the pundits often focus on the wrong issues in discussing why people are angry or happy about election results. Pundits often seem to think it is the actual issues that are driving people’s reactions. But in the end, it might be that the parties – or, following the sports analogy, “the clothes” — that drive people’s reactions. Let me close with one more observation. If people are just rooting for parties, then efforts to “reach across the aisle” may be quite difficult. Again, think about sports. When LeBron left Cleveland, fans of the Cavaliers suddenly hated LeBron. He was still the same player, but his clothes had changed. The same story seems true in politics. Obama because he plays for “team Democrat.” And the same may be true if Mitt Romney becomes President in November. As long as he persists in playing for “team Republican,” Democrats will not be happy with Romney. If this is true, then “reaching across the aisle” may be pointless. Fans of the opposite party are not against the President because he doesn’t agree with them on the issue. They are against the President because he plays for the “wrong” team. And unless he is willing to change teams (i.e. change clothes), he can try to “reach across the aisle” all day and he will never make the other team’s fans happy. Likely true. There's always been that argument of identification voting vs. rational/issues-based voting, with the thought that those with a higher/broader education will move more towards the latter. Yet, all that really seems to be happening is that more educated voters are only rationalizing and "spinning" the evidence to accommodate their identity. Of course there are exceptions, as singular confounding variables can have strong influences on behavior change, but it really seems the only voters that are readily "won" by rational arguments are those that come from a background of little political identity, i.e. a household where their parents just didn't harbor strong opinions on political arguments. I am so extremely not shocked to see research confirm this. As an independent, I've gotten into arguments with friends who have come down on opposite sides of an issue depending on which party was in charge. The change that was most dramatic (just in my own experiences) was a strongly active Democrat who was vehemently (almost rabidly) against the Department of Homeland Security while Bush was president, citing the supremacy of privacy over a desire to feel secure. Now he is strongly for it citing security concerns as the absolute necessity of giving the DHS, FBI, and CIA very broad powers in phone/internet tapping. This is like a bizarro-world interpretation of the same facts that lots of people have noticed. I wouldn't say that issues don't matter, but that some issues do matter and on the other ones people just fall in line. There's also the effects of propaganda - I'm sure if you asked the average Republican they would not agree that the ACA and Romneycare were essentially the same thing. It's not because they're not the same thing, but because they've been told repeatedly that they're completely different. Most Americans couldn't even choose the name of the VP on a multiple choice test, so assuming that voters are perfectly informed is going to lead to wildly incorrect conclusions. Also, about sportscasters as pundits - look at Keith Olbermann and Rush Limbaugh. Bill O'Reilly came from the tabloid news world, which can have a team mentality. This has an effect on the way people understand politics, especially if they're more drawn to one party in the beginning and then become hardened over time. All this is to say that "Issues don't matter as much as they should" isn't exogenous; it's a direct result of our political environment. "One might think that in sports fans are rooting for players." Huh? Though I'm not a sports fan (I try never to get too close to a fan of similar mass lest we undergo mutual annihilation :-)), my impression is that fans root for teams, so if your Charles Barkley (who I presume is an excellent player?) played for the Yankees, then Yankees fans would root for him; if he switched to some other team, they would not. Indeed, a long-term fan would, over the course of his life, see many complete changes in a team's roster while still remaining a team fan. As for the application to politics, the idea is interesting, but what about the independent/nonpartisan voters? There's no real equivalent in sports, I think, as we non-fans can pretty much ignore the whole shebang without any significant adverse effect. Yet if we ignore politics, it will affect us regardless. I think we see this in the graph: partisan opinions swing depending on whether "their team" is winning, independent opinion stays pretty constant. "Maybe we need to have sportscasters discuss our elections"? Don't we have that already? There is almost no reporting on issues. It's mainly polls and gaffes. Issues are discussed only insofar as they relate to polls and gaffes. Why would anyone care what a pre-election poll shows, other than the candidates themselves, who might be able to make half-time adjustments based on them? Their only value to the rest of us is that they allow us "to check the score" during the game. Important to the sports fans of politics, not to the rest of us. And the gaffe reporting has all the substance of ESPN's "Not Top Ten." It is fun to watch Democrats cheer Obama on, even though he has behaved like a moderate Republican as much as anything. Equally fun are the Republicans who loathe him despite him being, essentially, one of them. Just by saying something doesn't make it true. You're not Obama. ...and this is why I don't bother to vote. This is why parties are bad (for the functioning of a country). This is also why parties exist (since they make it so much easier for career politicians to stay in power). Maybe that's why I'm not a sports fan or enthusiastic about political parties. I would honesty prefer a name picked out of a hat over anyone either of the parties have put up since Bill Clinton and him only marginally. First, there are specific areas where Presidents can effect the oil markets. When Obama refused to approve the Keystone pipeline, that caused an effect on the oil markets. When Obama's team implemented a drilling moratoreum on deep-water drilling (against the recomendations of the scientists), it effected the oil markets. However, if he allowed unfettered free-market to reign, there is little he can do to effect changes, meaning he can drive up prices through policy and regulation, but once he removes those barriers there is little he can do. Second, I wouldn't read anything that Ezra Klein wrote, because he is little more than a FAR left wing political hack. You might as well quote Ed Schultz. If this were completely true, why is it that the winning party changes so frequently? If we assume people don't change teams, then there should be no variation in electorate outcomes, but the last four presidents have alternated party. If team is all that matters, then there are only several reasonable explanations I could think of for this trend. One is that the new constituent of voters dictates the change in trends. Each consecutive generation that can newly vote would dictate the differences, but everyone knows young people don't vote so not sure how strong this effect would be. Another explanation is that independents are the ones who matter, as everyone else essentially negates their vote. In which case, pollsters should stop bothering to talk to the color followers. More than likely, the independents are the only ones with opinions of their own anyway. Anyone else have a good explanation for the varying trends if party loyalty is so strongly determinant of opinion? Independents. Elections are usually close overall. A win by more than 10 percentage points is considered a huge landslide. So even if 90-95% of voters follow their tribe, and the core voters are evenly divided, that leaves plenty of voters left to be won over by campaigns. But whom the independent voters are is not static. It’s not the ignorant tribal masses being ruled over by thinking ubermenschen; it’s more like everyone is tribal 95% of the time on average, but at any given time 5% of voters are open to be swayed by the outside world. There is also a “Team Throw-the-Bums-Out” whose tribal affiliation involves disdain for both parties, especially whichever one is in charge. They all agree whoever’s in charge is awful (and they might be right) without considering that the challengers may be even worse. I wouldn’t be surprised to find that 90% of EVERYTHING humans have opinions on (sports, politics, fashion, music, art, religion, etc.) is due entirely to our need for tribal identity. And don’t think that if you’re a moderate or an independent you’re above it all. Rooting against the clothes of both parties can be just as irrational and unhelpful. I believe Seinfeld used the phrase "cheering for laundry" not "rooting for clothes". The problem Republicans have with Obamacare is that it violates the US Constitution, which states clearly that powers not delegated to the federal government are left to the states and to the people. Therefore, implementing a health care plan in the state of Massachusetts is well within the rights of the Massachusetts state government. Implementing Obamacare, on the other hand, is not within the rights of the federal government. See the difference? That has nothing to do with clothes, it has to do with following the Constitution. While the phenomenon of rooting for clothes seems analogous, in reality, sports and politics are very different. If I am a fan of the Cavaliers, I want them to win. I root for LeBron because he helps my team do that. If he leaves, I no longer root for him because all his efforts are designed to help his team win, which means they are designed to stop my team, the Cavs, from winning. If he leaves in spectacularly douchey fashion, well, that just make hating him all the easier. In politics, the goal is not "winning". Or, it ought not be. I shouldn't care if a Dem or a Rep wins; I should care about my ends being pursued via policy. I should care about my ideas winning, not my side. The extent to which I care about my side winning is the extent to which I ask not to be taken serious.